This month there have been quite a few new purchases and trying out new products, some of which I can’t believe I have waited this long for, which brings me nicely to my first product or should I say ‘tool’. As you know I love make-up brushes and recently I have become a bit addicted to real techniques. Before buying their brushes I do watch the pixiwoo tutorials so I know exactly what I am getting. I absolutely love the expert face brush, it is so great for blending in cream based or liquid based foundations for a medium to heavy coverage. I haven’t actually tried it on a powder foundation yet but I’m sure it would still be great. The bristles are so soft and give you a flawless finish. I have seen others use it for cream blushers which I’m sure works great too but I like to keep mine for foundation. I have been so obsessed with mac lipsticks for such a long time that I have not tried other lipsticks at all! I really wanted to try the berry stained lips look that is such a huge trend right now so I thought I would try a cheaper alternative first and then go to mac to officially purchase the infamous rubywoo. I bought shade 107 from the Kate Moss lasting finish lipstick range and O.M.G I can’t believe how amazing these lipsticks are! I will be doing a full review very soon as they are just so great. On a night out I didn’t need to re-apply at all as it really did last! 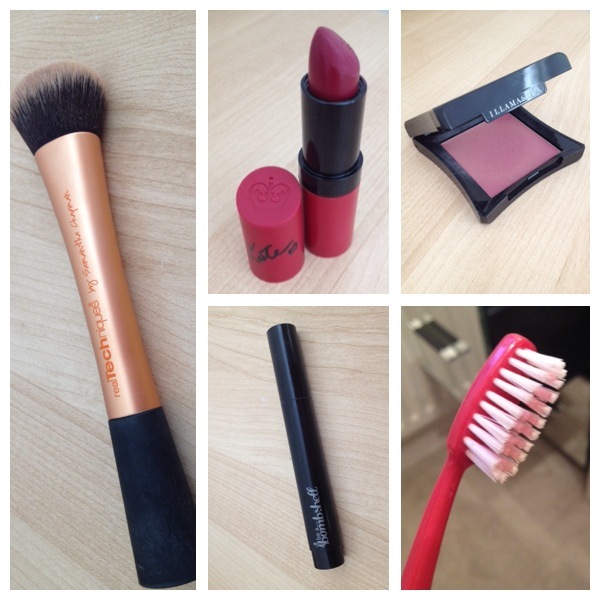 I also love the smell of the lipstick, it was a great buy and I have gone back to Boots since to try some more shades. A couple of months back I did a review on the new Illamasqua range, since then I have become a little addicted to my velvet cream blush (peaked) I use my real techniques stippling brush to press it on and it gives a great natural finish. You can build up the colour for a more dramatic look too. In my last month’s Glossybox (full review for the London Edition box coming up!) 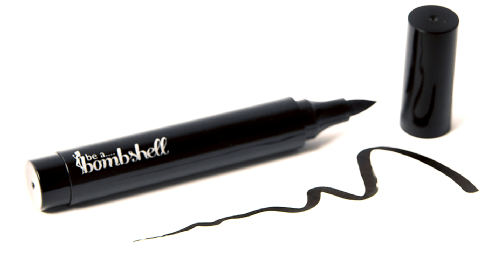 I received this great and very easy to use bombshell eyeliner pen. Since I tried it for the first time it has very swiftly made it’s way into my every day make-up bag. I love how easy it is to use and control the thickness of your liner and also how dramatic you want it to look. For the day I use it right on the tip to create a very fine line, close to my lashline and then if I’m going out I can just extend the line and thicken it. It is long lasting and water resistant so I love it! Ok, so my last item, I haven’t just started brushing my teeth in the last month! I actually use an electric toothbrush for my teeth but for this next tip any cheap toothbrush will do. I came across a video on youtube by one of my favourite beauty bloggers, Huda. She shows you how to backcomb/tease your hair with a toothbrush. As toothbrushes are so cheap and even free on planes and in hotels, I gave it a try. Ladies…it works like a pro! It’s a great little tool to wisp away those little baby hairs that stick up after blow drying too.